Today I wanted to visit the Bayview Ganesha Temple instead of the local Murugan temple (that I normally attend) due to the increasing clashing of egos and political opinions. For me, a temple is a place that one can go to, to escape the worldly troubles of everyday life. When people (and I stress the usage of the term 'people' instead of 'devotees') attend a temple and forget to leave their egos and politics at the door step along with their footwear, it just decreases the sanctity of the temple atmosphere. It is no longer an abode of peace that devotees can seek refuge in  rather it becomes a stage for ignorant people to act out their egos. So for this reason, I wanted to attend another temple which also had a Murugan vigraham but was free of egos and politics. My mother wanted me to continue going to the "political temple" but I refused stating that, "Murugan is not only in a single temple. He is everywhere and I cannot worship properly and in peace if people always argue because they differ in their opinions. Muruga will be with me whereever I choose to go and worship. He is everywhere." I repeated. Thus, my mother decided to continue going to the "political temple" and I went to the Bayview Ganesha Temple because I did not want to engage in useless politics. When I arrived, the puja was just underway for Lord Ganesha. I performed thoppa-karanam and prostrated before Sri Ganesha and offered my salutations and namaskarams to the loving brother of Sri Skanda. Then there was a yagna in procession followed by an abishekam for Lord Skanda. A family was doing this and I joined them as an onlooker and partook of the wonderful puja in progress. In my heart, I was singing within myself Sri Skanda's favorite Thiruppugal songs. I sang numerous ones while contemplating of His beloved feet. In my heart I called out to Him, "Muruga. I'm sorry I did not attend the other temple that I normally go to. But I know you are here with me regardless of whereever I go. Be it this temple or another one. COULD YOU PLEASE BLESS YOUR CHILD?" After humbly submitting this request, I did not ponder on it any longer. I continued to sing within my heart Thiruppugal songs for my loving Lord as the priest performed the puja on the tall and beautiful Murugan vigraham. Then after the puja to Murugan was finished the puja for God Siva commenced. I stood in front of the Sivalingam and sang Thevaaram songs for my loving God. 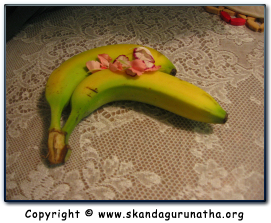 As the puja ended, the priest came my way and presented me with some banana and flower petals as prasadam (see figure above). He then said,"Take this [prasadam] and wait in front of Murugan." I found it rather strange that the priest was talking to me considering that I didn't even know him. As I stood patiently in front of Lord Murugan, I looked around and all the devotees were gathered at the smaller utsava murthis where the priests were chanting the vedic mantras. There was no one near or standing in front of the Murugan altar except myself. 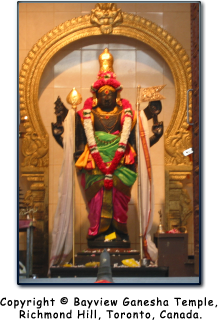 After a few minutes, the same priest who told me to stand in front of Murugan came and went to the altar where the towering form of Sri Skanda stood. He then took a big bright red rose flower that was nestled in the large garland adorning Lord Skanda. He then also took some vibhuthi and some bananas and came over to me and said,"Here. Take this." 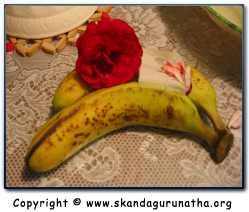 (see figure below...this is the flower that the priest took from Murugan's garland and presented to me.) Realizing that this was Sri Skanda's response to my INNER request ("COULD YOU PLEASE BLESS YOUR CHILD? "), I immediately prostrated at the priest's feet thinking it to be that of Lord Skanda's! I never uttered a single word since I entered the temple and yet this was the miracle taking place! After presenting me with the flower, the priest smiled and then joined the other priests who were conducting puja for the smaller utsava murthis. I stood overjoyed that Sri Skanda had heard my prayer, I felt so humbled to be the recipient of His grace. Then the priests asked some devotees to come and carry the murthis. There was Ganesha, Murugan (with Valli and Devayanai) and Lakshmi. Devotees all eagerly came forth and carried the murthis on their shoulders. However, for Lakshmi, there was one man who was a little short so the priest asked me to carry the murthi from the front! So, Ganesha led the way followed by His brother (Murugan). Behind and following Murugan was myself with three other devotees carrying Sri Maha-Lakshmi. The remaining devotees who were worshipping all followed behind (after Lakshmi had joined Ganesha and Murugan). As we carried the deities around the entire temple, I was even more humbled as I was always following behind Sri Skanda. It was as if I was His little puppy dog following His master wherever He went. After we put the murthis back the same earlier priest strangely enough spoke to me saying, "Are you happy now?" I said,"Yes, extremely." I prostrated in front of the murthis and then watched the temple proceedings come to an end. Overjoyed, I retold this experience to my mother who wished herself that she had come with me today to the Ganesha temple. She said that the "political temple" was not as enjoyable as the experience that I had described. I replied, "Amma - Murugan is everywhere, no matter where we worship."